A little over five feet in height, casually attired, sporting a floppy hat and a seldom lit cigar protruding from the left side of his mouth, is the way most describe Charles Austin Shea. At the time that Six Companies was being organized he had reached the age of 47. He was the second generation owner of the J. F. Shea company, started by his father John Shea in Portland, Oregon in 1881. John Shea was a plumbing contractor and supplier. The construction company as we know it today was created in 1910 along with Charles's two brothers as they began to get major contracts for sewer construction. They then branched out laying pipes and tunneling, and by 1931 was the largest builder of tunnels and sewers on the West Coast. The Shea company had a major role in establishing San Francisco's water supply system. Quoted as being an unpretentious, feisty Irishman who was willing to jump into big projects, Charles Shea was also known as being a people person, willing to support the workers. Though very wealthy, he shunned ostentatious demonstrations of his success. He would often work from simple hotel rooms rather than a fixed office or corporate setting. He is stated to have said that "I wouldn't go near a bank unless I owed them at least half a million dollars...that way you get respect." When approached by Harry Morrison to join the nascent Six Companies consortium, Shea jumped at the opportunity to become involved in the Boulder Dam project, and promptly put up $500,000 towards the construction bond. He than suggested that the group could use the expertise of his friends at Portland's Pacific Bridge Company. Pacific Bridge likewise seized the opportunity and put up $500,000. Shea, because of his experience with tunneling and his affable personality, was appointed to the onsite executive board as head of field operations. This was fortunate for Frank Crowe, since with so many "cooks in the kitchen" in the form of the higher executives of Six Companies, Crowe was being constantly micromanaged in his daily operations. This was not Crowe's style, and might have caused problems. Crowe might have walked away from the project. 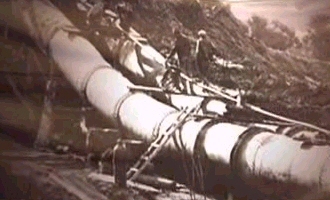 However, Shea gave Crowe a free hand at the dam site and Crowe appreciated the experience that Shea had to offer in terms of the diversion tunnel work. The real construction of the dam could not begin until the four diversion tunnels were completed to divert the flow of the often unpredictable Colorado River. Unlike the Wattis brothers of the Utah Construction Company, at least Shea lived to see the Boulder Dam project completed. He then went on to other projects in the West, and as WW II approached, like all of the other major builders, got involved in war production. He died in January, 1942 in San Francisco of cancer at the age of 58. The legacy of Shea lives on today in the form of the J. F. Shea Company, Inc. In addition to major construction projects such as the Washington, DC subway system, the company branched out into housing and planned communities and the Shea Homes division has continued to be a lucrative growth factor in the organization. Today, J. F. Shea Company is the largest privately held builder in the United States. The company legacy of unbroken family management continues.